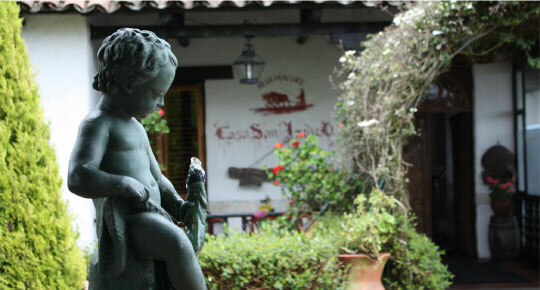 The Casa San Isidro restaurant has a privileged location: the top of the Monserrate Mountain, icon of Bogotá, the capital of Colombia. There you will find a colonial mansion that evokes the tranquility and delicacy of the mid nineteenth century Bogota, where you can savor a dinner with the soft sound of the piano or on the terrace, where you can enjoy the breathtaking and majestic panoramic view of the city. San Isidro is the ideal place for an unforgettable romantic dinner. It is also the ideal place to taste the best of French cuisine in Bogotá. There you can eat meat, poultry, rabbit and fish in diverse presentations. The lobster season begins in September and runs through late October. During this season you can enjoy lobster in several and delicious presentations: brochettes, soups, ceviche, and sautéed and served in various sauces or in pepper. In March takes place the Lenten season. Following Catholic tradition, during this season, San Isidro offers a selection of seafood from the Mediterranean and the seas of southern Chile. The French Menu season occurs between June and July. During this season you can enjoy cutting-edge cuisine from different regions of France plus a selection of the best French wines. Between November and December takes place the wine and champagne season. In this season you can buy wines and champagnes at great prices, as well as enjoy a menu designed by a personality of the Colombian gastronomic circle. San Isidro allows different payment methods and has the advantage that, if necessary, you can pay your bill in dollars. Finally, it is important for you to know that for going up or down of the Monserrate Mountain, you should consider the schedules and the prices of the cable car service.